The idea behind our homify 360° segments is not only to treat you to beautiful houses and envy-inducing structures worldwide, but also so you can catch a firm amount of inspiration for your own spaces. Whether it’s a particular window shutter on a country house in Tuscany or the layout of a terrace on a property in Sydney, feel free to gather as many architectural- and interior design ideas as you please – and enjoy doing so. 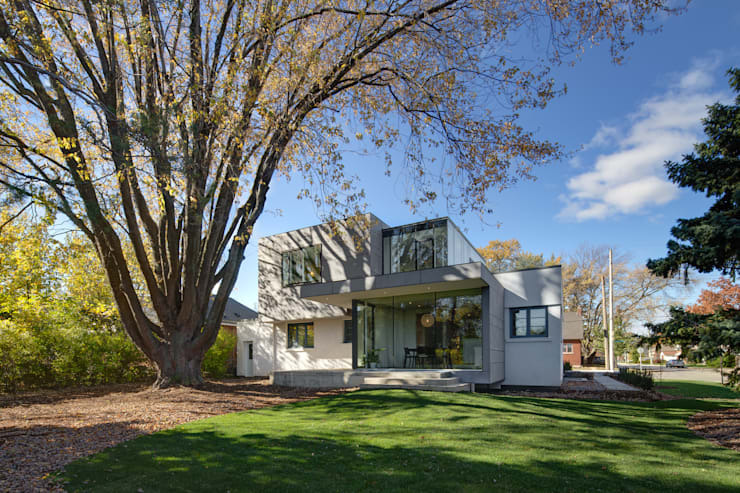 Today’s discovery takes on the form of a modern family home that flaunts quite the stately look on the outside. Yet the insides are not far behind, as they manage to bring elegant materials, clever colour combinations and light-filled rooms to the table – all to inspire you, of course. We thought an evening shot of this majestic house would do nicely for an introduction, seeing as the background is just starting to darken, causing the interior lights to beautifully illuminate the interiors. Notice how strikingly the bottom- and top levels of the house contrast with each other; crisp white concrete and crystal-clear glass, both bringing their own unique look and style to combine into an eye-catching structure. Add to that a garden area that looks to be quite immaculate and fresh-as-a-daisy, and we are already in love with this stately family home! The rear side of the house presents a much more open and welcoming vibe than the front, and it does so with a vast garden. But it’s the way in which nature interacts with the man-made structure here that has us interested. Take the huge tree, for example. Many homeowners and architects would have opted to remove it before construction; however, here it fulfils a prime purpose to provide both shade (especially for that beautiful terrace) and fresh detail to the outdoors. And speaking of outdoors, don’t you love how the house’s glass-clad façade interacts with the back garden, allowing fresh views and daylight to stream indoors on a daily basis? On to the interiors and first up on our list is the dining room, situated right beside that gorgeous rear terrace we just encountered. The entire room comes alive thanks to the floor-to-ceiling glass doors, which make this modern space seem even bigger and brighter. Our favourite piece in here definitely has to be the circular ceiling light, which contrasts subtly yet so wonderfully with the linear styles and cubic designs that dominate this space. The colour palette takes a cool turn (visually) in the kitchen, with a fresh arctic blue adorning not only the one wall, but also numerous appliances including the stove and fridge (both flaunting a vintage look quite successfully, mind you). 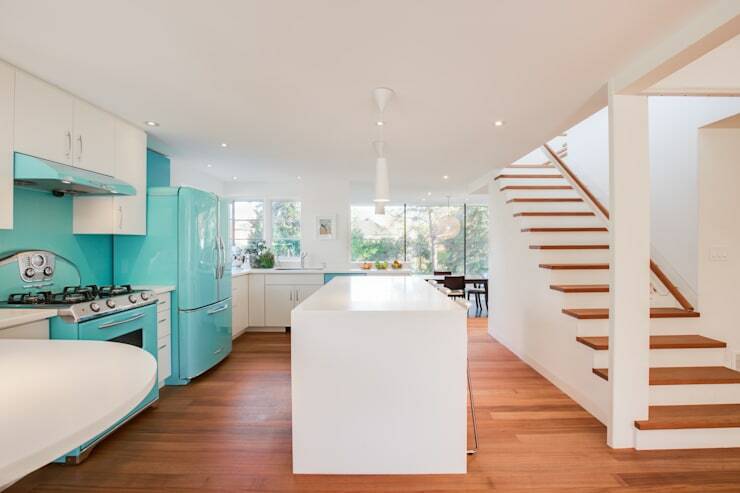 This delicious change contrasts so well with the rest of the kitchen’s hues and modern style that one cannot help but wonder which side is more successful – or perhaps they complement each other so well that they cannot work alone? Don’t break your brain trying to decide – it’s an exquisite space with a striking design, and we love it! 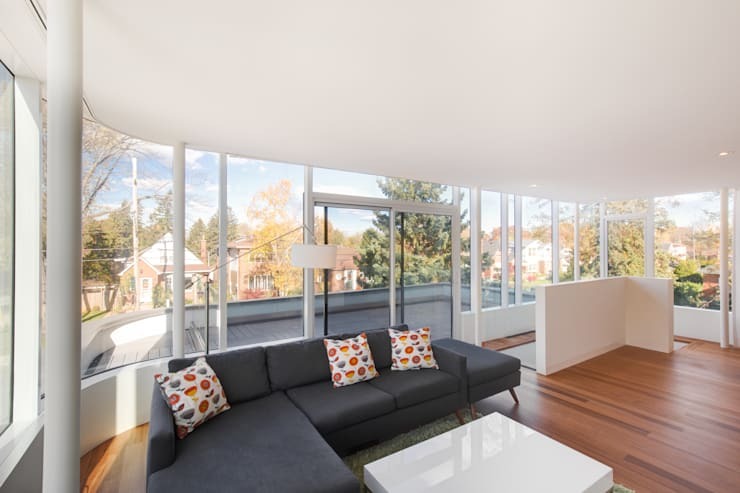 Now for when you want to relax on a comfortable sofa with a glass of wine, may we recommend this living room which (like the dining area) opens up superbly onto the surrounding exteriors? 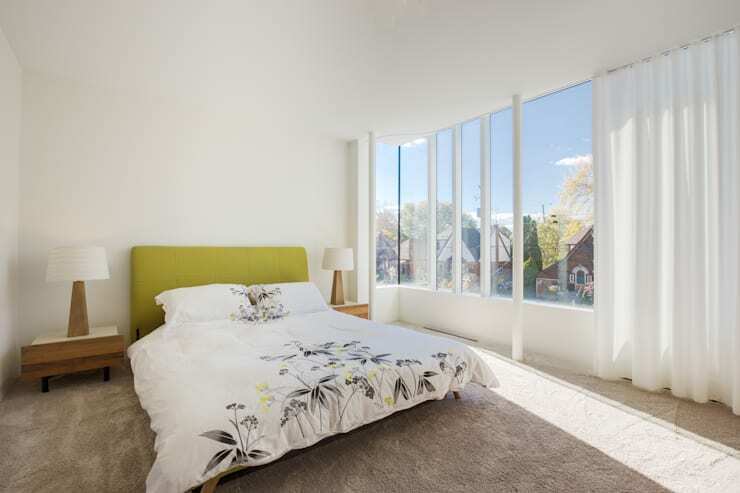 Thanks to the generous glass panes, this living area will be combined with fresh sunshine and blue skies during the day, and lit up via glittering stars at night. Perhaps that’s why the internal décor department is so subtle, opting for a ‘less is more’ approach. So modern, yet so comfortable. The bedroom also decided to keep things light and quiet regarding decorations, yet does treat us to a friendly patch of chartreuse green for the headboard. This stands out so deliciously, especially since the surrounding hues are all light and neutral, lit up fantastically via the incoming sunshine. The ‘less is more’ approach continues into the bathroom, yet is met with a cutting-edge style that is wonderfully contemporary. 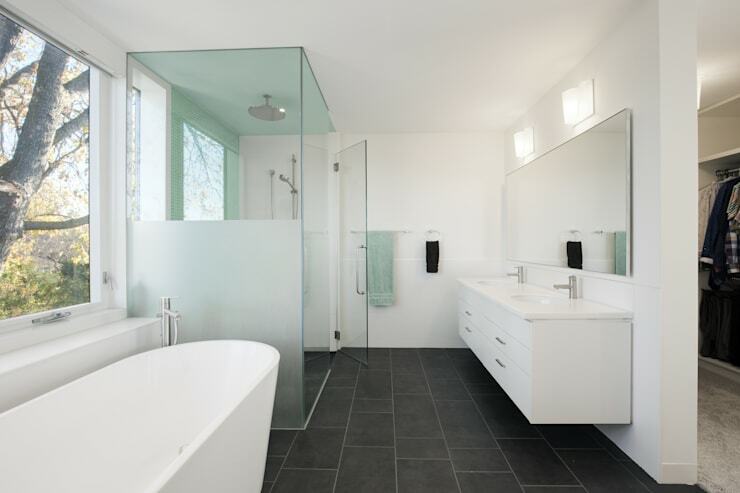 Sharp lines and crisp natural hues ensure a memorable and bright space, reminding us yet again of the importance of not neglecting a bathroom’s design. Now how about a nice, hot and relaxing bath in that oval tub while admiring the glittering night sky through the window? For your own bathroom space, we bring you these: 10 new practical ways to create your unique bathroom. So, did this house inspire your inner designer?